Saucony’s marketing pitch: The perfect balance of cushioning and responsiveness. 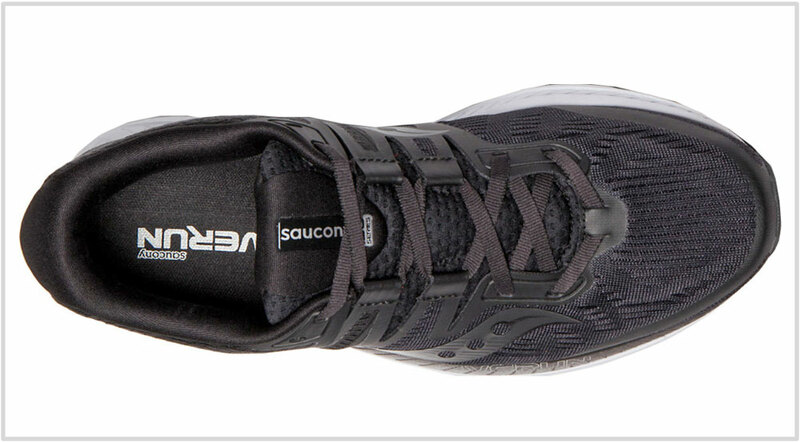 Upper: Engineered mesh, ISOFIT strap system, inner sleeve. 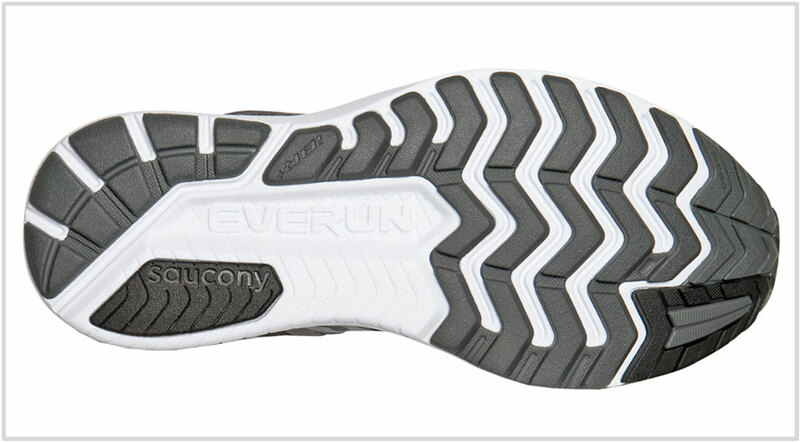 Midsole: Full-length EVA foam with an Everun topsole. 8 mm heel-to-toe gradient. Outsole: Hard rubber under the heel, softer blown rubber under the forefoot. Widths available: D - regular (reviewed), 2E-wide. 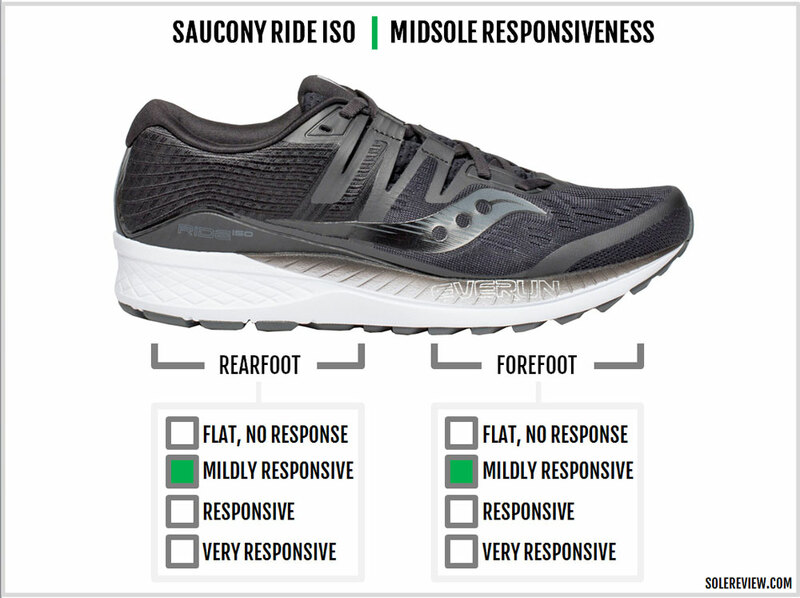 The Saucony Ride ISO's cushioned ride quality appeals to most runners looking for a daily neutral trainer. That said, the ISOFIT upper is a hard sell. 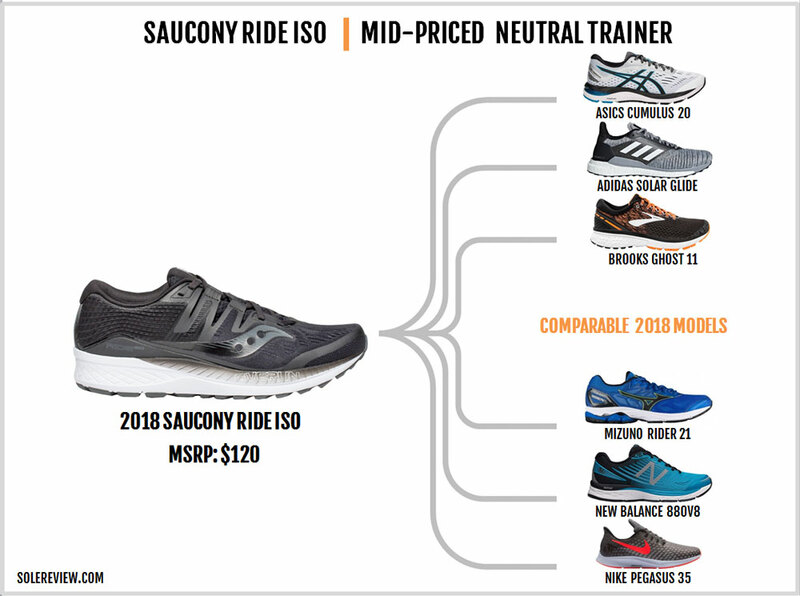 For many years, three neutral running shoe models have dominated the $100-130 price segment. The first two are the popular Nike Pegasus and the Brooks Ghost. 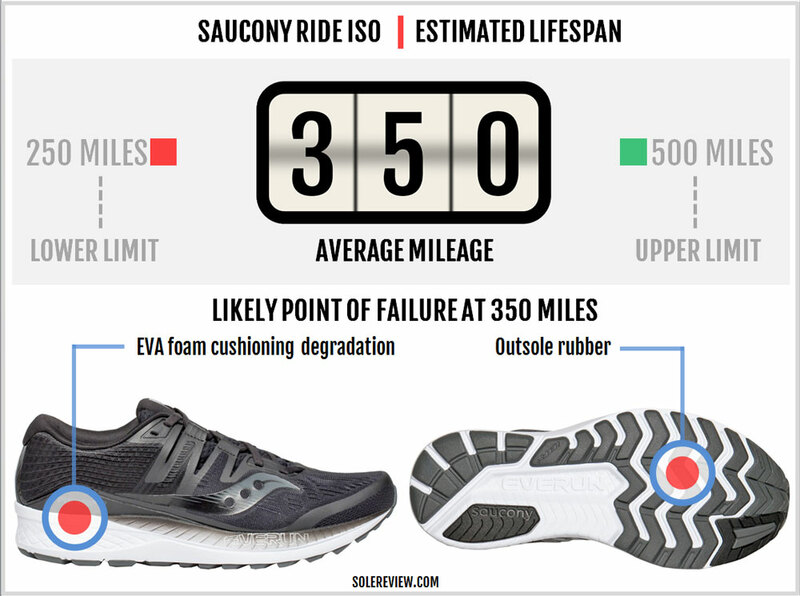 The third shoe has built its reputation over the past decade, and it’s now known as the Saucony Ride. What’s of interest is that all three offer a differentiated ride and fit experience. If you wanted something nimble and cushioned with a smooth and a spacious upper, the Nike Pegasus was it. And if one was looking for a supportive neutral, the Brooks Ghost was the go-to shoe. On the other hand, the Saucony Ride had a cushioned yet somewhat firm ride compared to the two. It also had a snug fit, though an optional 2E width was always at hand. Like all running shoes, all three have evolved over the years. The Saucony Ride is no exception. The 2018 edition makes it the eleventh in the series, and the new model gets the ISOFIT treatment. 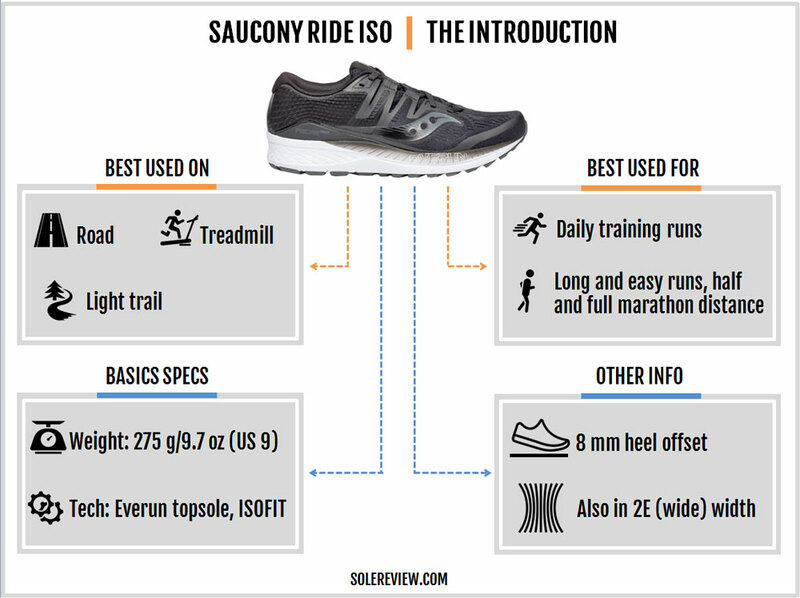 In other words, the Saucony Ride now comes with an ISOFIT upper, a strap-based design which made its first appearance on the Triumph ISO. 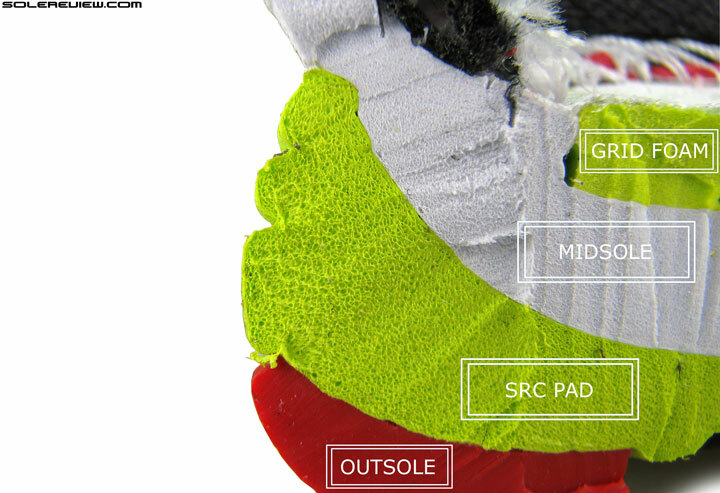 Barring a few updates, the core set-up of the midsole and outsole is fairly similar to the outgoing Ride 10. As one would expect, there’s a fair bit of the Ride 10 in the ISO’s ride character. 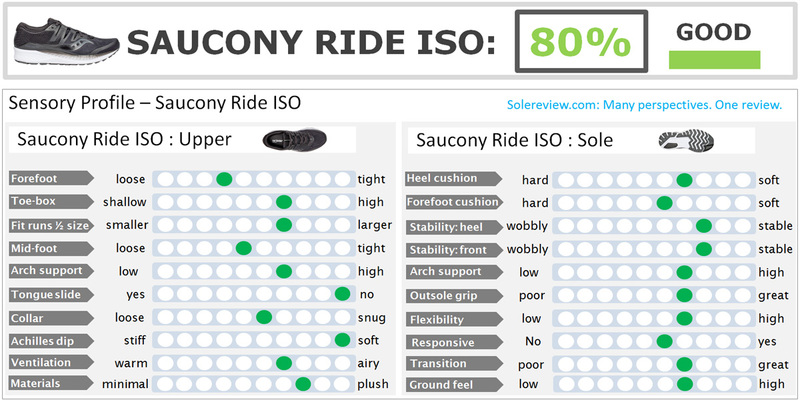 Which is good news, because the Saucony Ride’s reputation was built on its stellar ride quality. Why fix something which isn’t broken? The same can’t be said of the ISOFIT upper. While the Ride ISO gains some much-needed forefoot room, the fit experience could have been better. The ISOFIT midfoot localizes pressure instead of spreading it uniformly and the tongue tends to gather when laced tight. At a conceptual level though, there’s no reason why the ISOFIT shouldn’t work. After all, multiple straps lying flush over the midfoot should result in a better lock-down while reducing some weight. And Saucony got most of it right with the first generation ISOFIT. To be specific, we’re referring to the 2014 Triumph ISO. And it went somewhat astray from there on. Just for the sake of annual newness, Saucony introduced different variations of the ISOFIT – some of which led to a sub-optimal fit. This had to do with changes in both the tongue construction and the lacing design. One noteworthy change was replacing the molded tongue center-piece with a soft, non-molded mesh. The molded component helped the tongue sit flush over the foot and do a better job at filtering top-down lacing pressure. 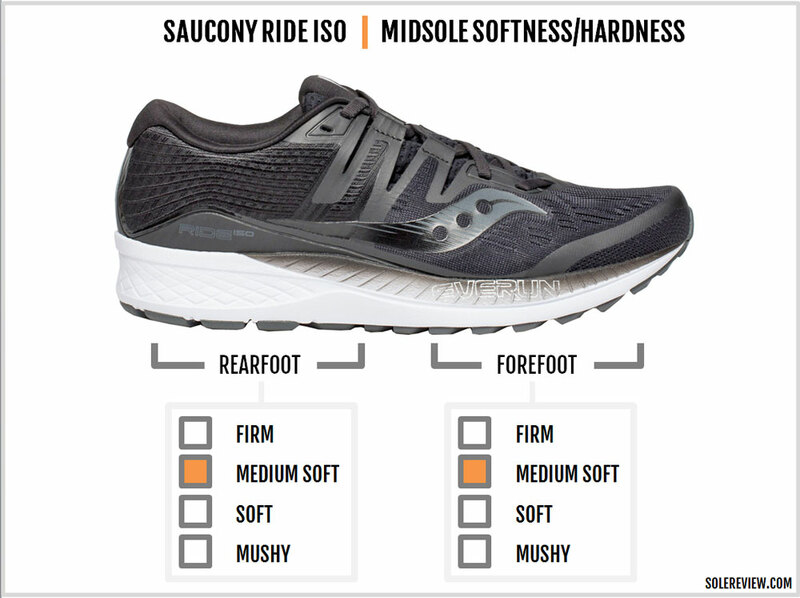 However, we’d like to underscore that not all Saucony ISOFIT models have a sloppy fit. The Freedom and the Liberty, for example, have a molded piece over the tongue which makes the fit far more palatable. But then, this case-by-case outcome makes the ISOFIT experience inconsistent across models. This isn’t exactly a good thing, because one never knows what to expect. The Ride ISO adopts a partial ISOFIT panel without the molded tongue component. The fit quality leaves something to be desired, and one wishes for the sorted midfoot fit of the Ride 10. Interestingly, many brands tend to mess with the upper midfoot design. Perhaps it is because the midfoot occupies a lot of prime real estate on the shoe where the brands can showcase their design or ‘technology.’ Nike’s cord-based Flywire and the adidas plastic cage are two examples which come to mind. In our view, if ISOFIT is to continue, it needs to be based on an improved version of the original Triumph ISOFIT template. The key word here is ‘improved,’ not ‘different’ or ‘new’. 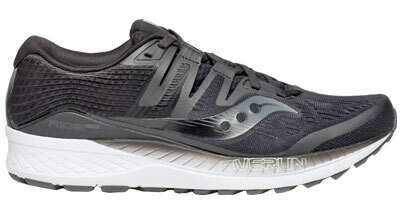 There’s a good reason why the Saucony Ride is a popular choice as a daily trainer and the occasional marathon shoe. The single-density EVA foam midsole has plenty of cushioning regardless of the distance. The heel-to-toe gradient is a moderate 8 mm, a factor which broadens the shoe’s appeal to a larger market. The Ride ISO is very lightweight for its category, weighing under 10 ounces/300 grams. Atop the midsole, the Ride ISO employs a removable sockliner and an Everun Topsole. The combination of these three layers makes the Ride ISO very comfortable to run in. The ride character is smooth, along with a consistent feel which can only come from an even spread of materials along the length of the midsole. It’s also very neutral and supportive. The midsole walls on the inner and outer sides are constructed thus so that the foam compression is well balanced. Below the rearfoot, there’s also a shallow cavity which helps center the body weight before the midfoot transition. As far as support goes, the Ride ISO’s wide forefoot feels reassuringly planted, and the foam density is in the Goldilocks zone between firm and soft – thus helping stability. The outsole looks familiar because the Ride ISO uses a geometry similar to the V10. The forefoot has rows of soft blown rubber strips separated by wide flex grooves. The lugs aren’t prominent, but they do a decent job at traction. The heel crash pad uses a harder rubber compound, and so does the solitary lug under the inner midfoot. The outsole maintains ground contact under the midfoot, thus helping with seamless weight loading. 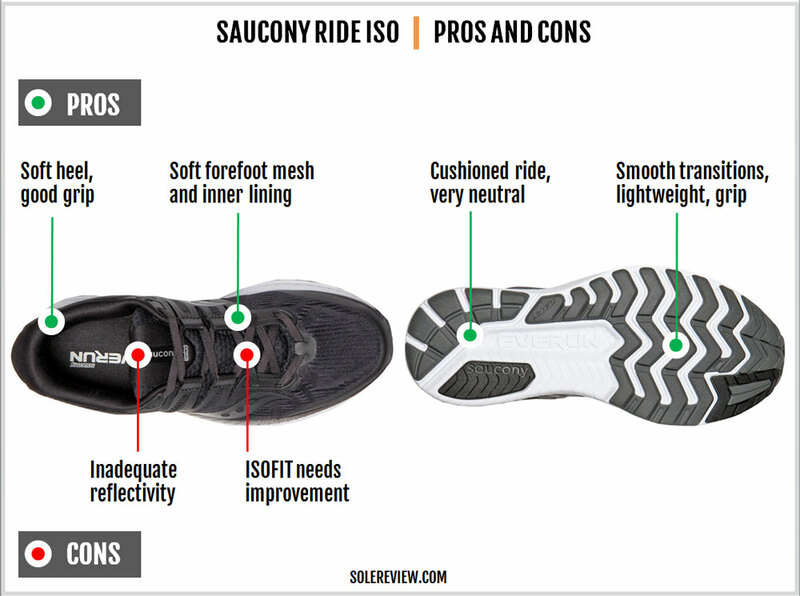 Compared to the Ride 10, the ISO’s midsole has a few updates which affect its functionality. To begin with, the forefoot walls do not slope inwards as much as the past Ride models did. This doesn’t affect the ride so much; rather, it turns into more upper room. A similar thing happens underneath the midfoot. The sides are straighter, and the edges are raised higher. Apart from making the midsole appear taller, this also increases the sensation of under-arch support versus the Ride 10. The rearfoot midsole now has higher sidewalls – an update also seen on the Kinvara 9 – so the new design is a ‘cup’ of sorts. From a real-world perspective though, the performance upside isn’t a lot. You also have the internal heel counter and the rearfoot cavity providing stability as well. The midfoot arch area is the only place where the higher sidewalls can be felt. The mid and rearfoot outsole has a couple of changes. The inner midfoot uses less rubber and more foam, replacing the rubber strip used on the Ride 10. The update makes this particular area of the outsole feel a bit Kinvara like. ‘Flatter’ would be a good word to describe the change – decreasing rubber usage reduces articulation and the ‘piston’ effect. As a side note, the single-density midsole of the ISO and V10 feels flatter when compared to the older Ride models. 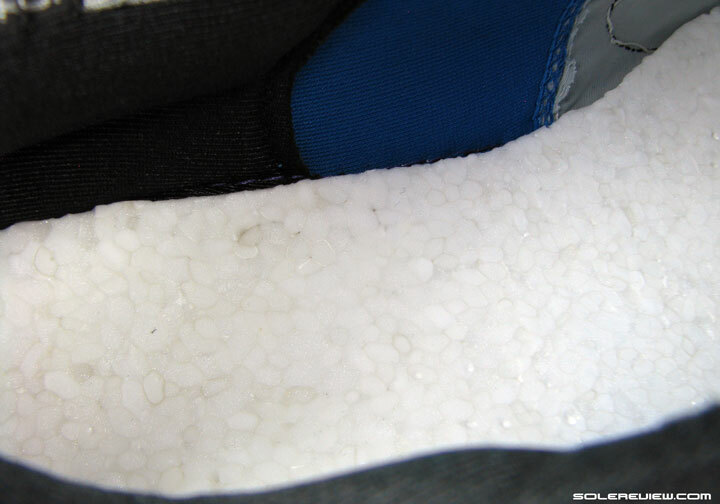 Till the version 9, the Ride had a dual-density midsole with a separate SRC crash pad under the heel. The multi-density configuration made the older midsole(s) feel more ‘substantial.’ Sure, the Ride ISO has an Everun Topsole but it is pretty thin and doesn’t make a lot of difference to the responsiveness. This observation is of little relevance if you’re trading up from the Ride 10. But if you’re slipping into the ISO right after the versions 7/8/9, this information will help manage expectations. If you compare the Ride 10 and the Ride ISO’s heel edge side-by-side, you’ll notice that 2018 Ride no longer has the curved bevel. The curved edge is commonly seen in many running shoes and is meant to smoothen transitions for heel strikers and also make the rearfoot a bit biased on the lateral/outer side. But unless you land on the heel edge, the design change will go un-noticed. And for those who do land there, the Ride ISO’s crash pad has deeper grooves to make the transitions less jarring. In many ways, the new Ride ISO feels like the baby version of the Triumph ISO – the non Everun version, that is. It’s cushioned, lightweight, and versatile enough for a wide range of workouts. What’s in a name? A lot, if the Ride ISO is anything to go by. Like its namesake, the upper gets ISOFIT-ted, resulting in numerous fit updates. If you were looking for fit similarities between the Ride ISO and the V10, there isn’t a lot to discover. What’s more, the forefoot and toe-box get increased splay room. While many assume that materials alone can lead to a substantial increase or decrease in forefoot space, that has seldom been the case. It’s usually the last (which is responsible for the upper shape) that matters. 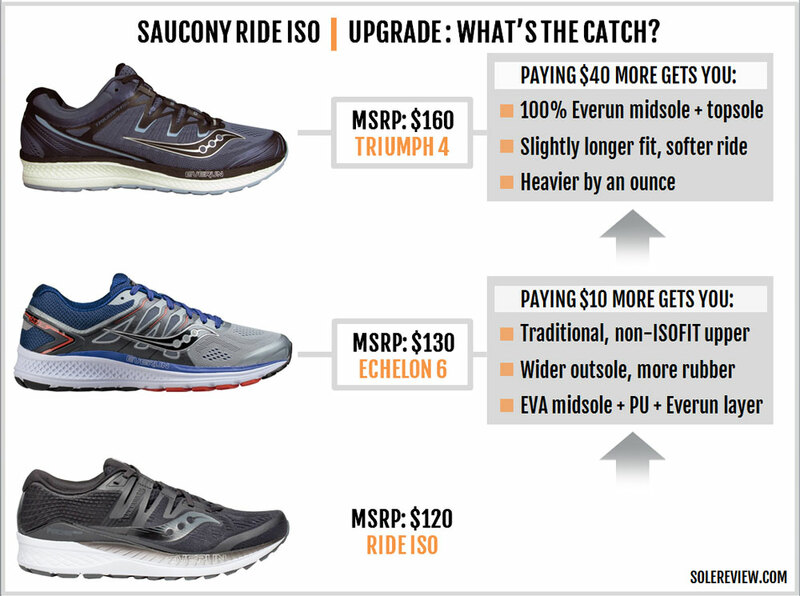 Saucony doesn’t mention a modified upper last in any of their marketing literature. That being said, we suspect that the new Ride ISO’s last has some alterations as compared to the Ride 10. After all, how can one accommodate an extra layer of material (the inner sleeve) without tinkering with the last? An obvious clue is the wider forefoot and midfoot midsole. And we’re not talking about the widest point across the outsole here, but the area where the upper meets the midsole edge. Previous versions of the Saucony Ride midsole had a prominent inwards curve, starting wide at the outsole and sloping narrower towards the upper. The Ride ISO’s forefoot has that slope too, except that it isn’t as acute as the Ride 10. This means that the foot now sits on a slightly wider base than before, hence resulting in more forefoot space without affecting the sizing. The Ride ISO fits true to size. Mind you, we’re not talking about a huge difference in dimension, maybe 2 – 3 mm at most. But when it comes to the upper fit, even a couple of millimeters make a huge impact. This change will come as a relief for many runners who found the older Ride’s fit to be borderline narrow. Sure, there’s a 2E width available in the Ride ISO as well, but the standard D width should accommodate runners who previously had to resort to a 2E. The toe-box has enough room – both vertically and sideways. The new mesh has a softer hand feel, and the same holds true for the midfoot and heel too. As a whole, the Ride ISO comes kitted with plusher upholstery than the past Ride editions. All that was the good part. Only if the new ISOFIT upper was flawless, but it ain’t so. Like the rest of the shoe, the ISOFIT midfoot feels plush over the foot. The tongue/sleeve combine has plenty of padding, and the lining is soft to the touch. As far as the materials go, there’s very little to complain about. On the other hand, the ISOFIT execution needs some work. The problem is that Saucony has tinkered with the original ISOFIT formula, removing the flat molded panel over the tongue. For 2018, this change applies to the more expensive Triumph ISO 4 as well. Instead, the tongue is now made of a single material and more prone to folding when laced tight. This wasn’t a problem on the original ISOFIT design because the flat section resisted folding. As a result, the tongue top doesn’t lie flush over the foot as you’d want it to. 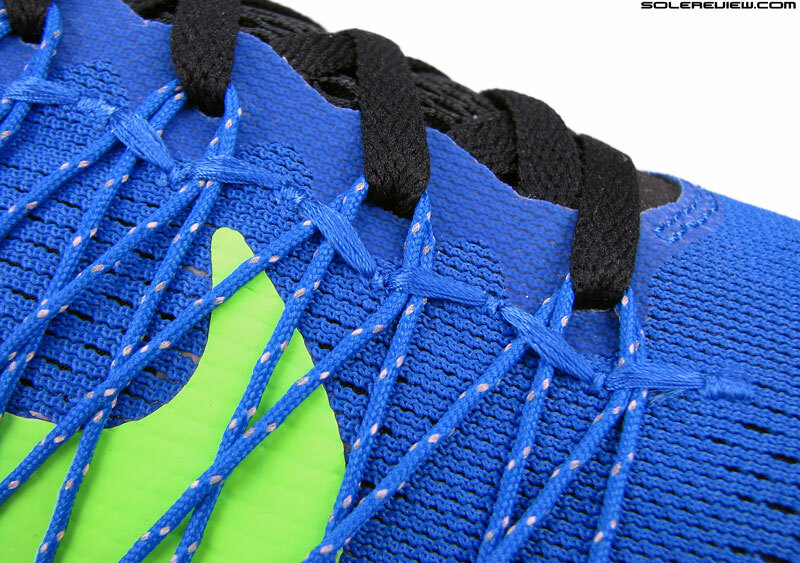 Also, the lacing pressure applied by the ISOFIT straps is more noticeable. The solution is simple. Go back to the roots of the ISOFIT design, and switch back to a two-component tongue design or equivalent. This will prevent the material from folding and also do a better job at insulating top-down pressure. The Liberty and Freedom ISO do not have a separate tongue panel. However, that is substituted by a molded synthetic overlay which results in a behavior similar to the two-piece tongue construction. There’s no heel slippage. The lining is soft and foam backed, and the Ride ISO now uses a single material to fashion its heel lining. The Ride 10 (and prior) used two different mesh types, one with more texture. We felt that the older heel design performed better from a fit perspective. 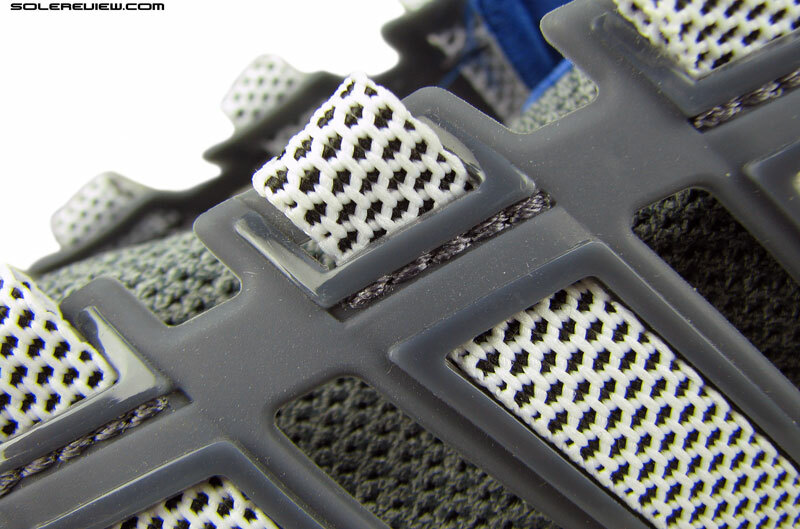 On the external heel, the Ride ISO has woven details – a variation of what was seen on the Ride 10. The woven detail is merely an aesthetic touch as most of the support comes from the hard internal heel counter. The Ride ISO doesn’t have a lot of reflectivity. There used to be a time when the Saucony Ride could blind you with its reflective elements. Not anymore – a thin strip over the heel is all that you get. There’s nothing adverse to report here. 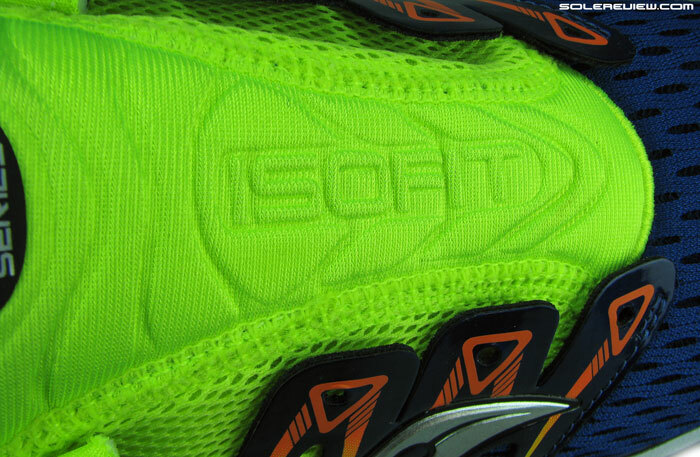 The ISOFIT upper has an abundance of layering all around which bodes well for durability. Wear and tear on the foam midsole and the outsole will happen gradually and should last 350 miles or more. 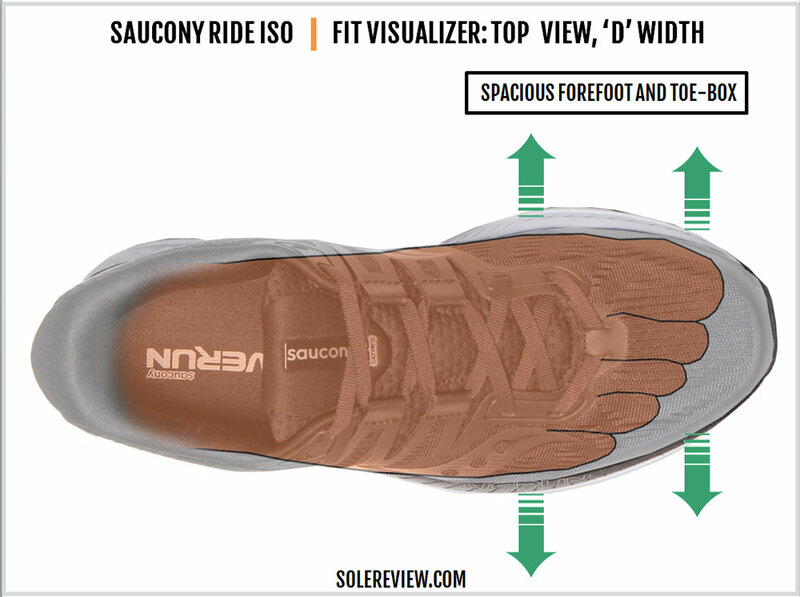 One small thing – if you haven’t been in a Saucony Ride since the 8th version, know that the midsole no longer uses the firmer SRC crash pad. 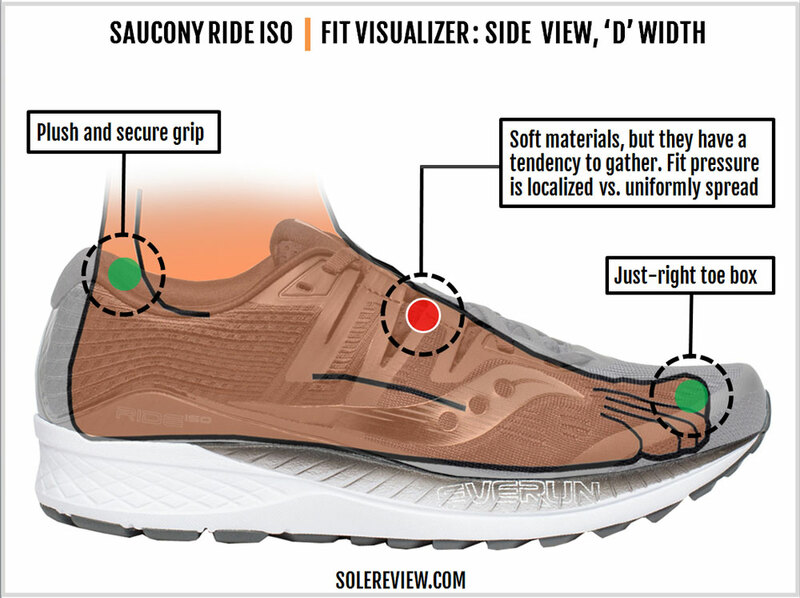 The single-density midsole is more prone to losing its foam cushioning as compared to the earlier generations of the Saucony Ride. 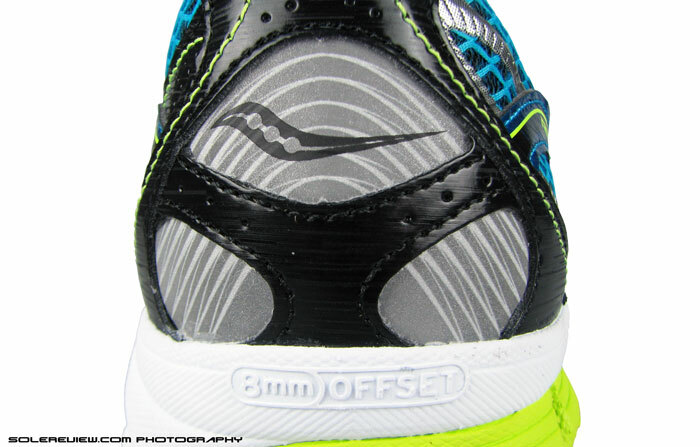 There is little to nitpick about the Ride ISO’s midsole and outsole. The heel-to-toe layering of the EVA foam and Everun topsole produce a cushioned, supportive, neutral, and smooth ride quality which has long been the shoe’s hallmark. The blown rubber forefoot grips very well. The wider midsole base this year also makes the ride supportive without adding weight. The upper materials feel plush and premium. 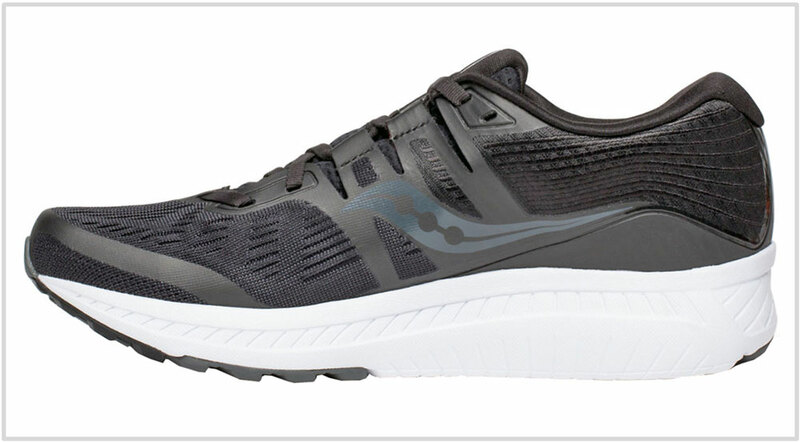 Compared to the Ride ISO, areas like the forefoot and heel feel softer and more comfortable. Where the Ride ISO falters is how the midfoot wraps the foot. The material of the integrated tongue and the sleeve accumulates when laced tight. The partial ISOFIT strap design also leads to an inconsistent distribution of top-down pressure. Also, there’s very little reflectivity on the Ride ISO – a far cry from the reflective overdose of the older Ride models. The Ride ISO is a competent running shoe, but what if you wanted something more cushioned? Or more supportive? The Triumph ISO 4 has a full-length Everun midsole which makes it softer (and heavier) than the Ride ISO. Its upper uses plush materials all around but suffers from the same fit imperfections associated with the ISOFIT construction. Not a fan of the ISOFIT upper? 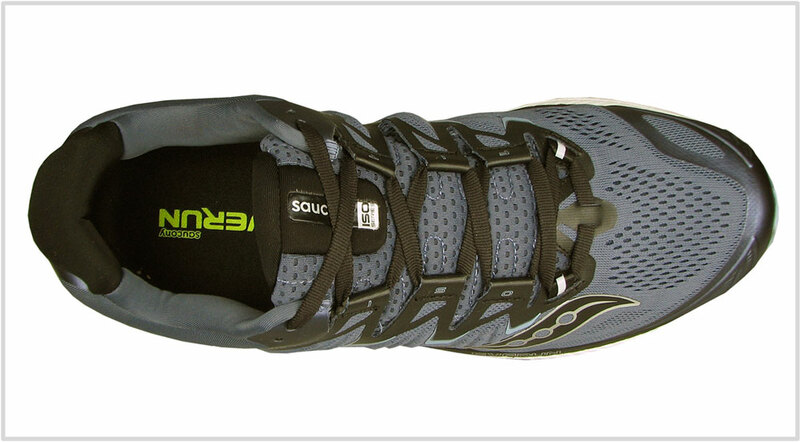 There’s still hope in the form of the Saucony Echelon 6 which uses a regular, non-ISOFIT upper. The midsole is mostly EVA foam with an Everun Topsole. Think of the Echelon 6 as a Ride 10 with a wider midsole. It also comes in a wide. The way we see it, there are a couple of paths to a three-shoe rotation. The first involves adding a more cushioned shoe and a lightweight trainer to the mix. In that case, you could consider the Saucony Triumph ISO 4 and the Kinvara 9. Outside Saucony, their equivalent would be the adidas Solar Glide and the Boston 7. The alternative (and our recommendation) is rotating a lightweight trainer plus a road-racer along with the Ride ISO. This way, you’ll end up with three shoes which serve distinct purposes. 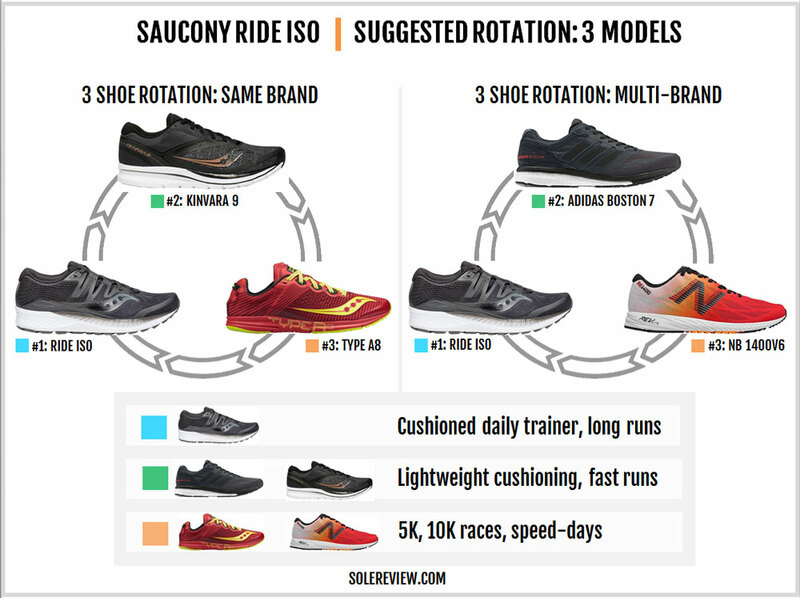 Thus, the Ride ISO can be rotated alongside the Kinvara 9 and the Type A8. If you’re wary of the Kinvara’s 4 mm midsole offset, try the combination of the adidas Boston 7 and the New Balance 1400V6, both excellent choices. There is a lot to choose within the $100-$130 neutral cushioning price-band. Besides the Ride ISO, our top-three pick would be the Nike Pegasus, the Ghost 11 and the adidas Solar Glide. The new Pegasus gets a full-length Zoom Air bag, the result of which is a cushioned yet snappy ride. The adidas Solar Glide is the softest shoe here due to its high-volume Boost midsole. The new upper is spacious, and the outsole delivers long-term durability. The Brooks Ghost 11 receives a major update this year. The heel is softer due to the new foam crash pad but overall, it’s a well-rounded neutral trainer. Both the New Balance 880V8 and the Asics Cumulus 20 serve up traditionalism with their multi-density midsole and relatively simpler upper designs. And the Mizuno Wave Rider 21, well, is the quintessential Mizuno with its distinct ride signature – courtesy of the plastic Wave plate. The Rider 21 is great for those runners seeking a somewhat firm yet neutral ride.